A new twist on the traditional chicken piccata! 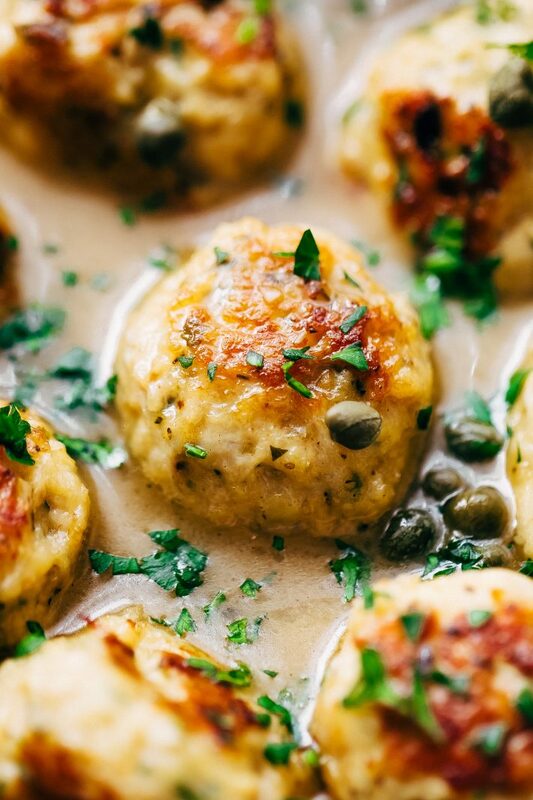 These chicken piccata meatballs are made with ground chicken and nuzzled in a rich lemon butter sauce. Serve it over pasta, quinoa or with crusty bread on the side. Can you tell I’m still trying to cling to the last of winter comfort food while progressively venturing into springtime flavors? Is it obvious, I can’t make up my mind at this point? 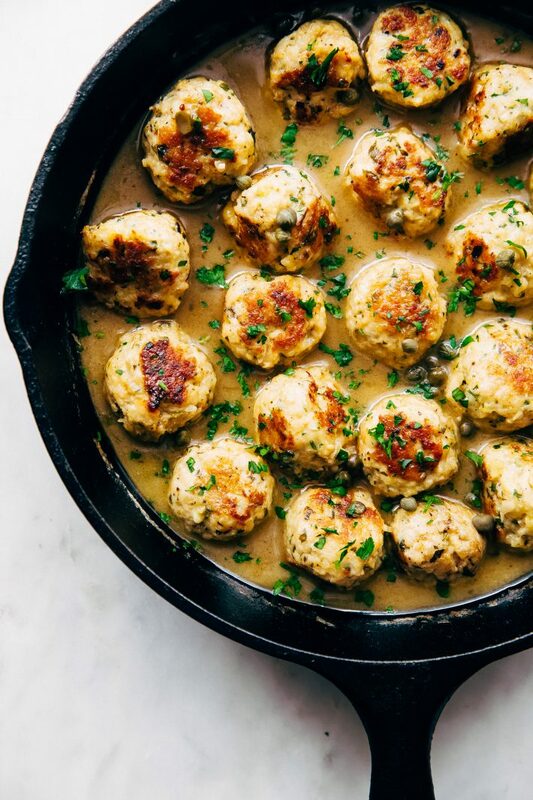 These chicken piccata meatballs are exactly that. Bright, beautiful flavors that are balanced. Warm and comforting like a hearty winter meal should be. Holy guacamole! I’ve shared a ton of meatball recipes with you guys over the course of 4 years. And I have to say; you guys have a place in your heart for chicken meatballs the way I do. Especially the firecracker meatballs! They’re always popular around Superbowl time! 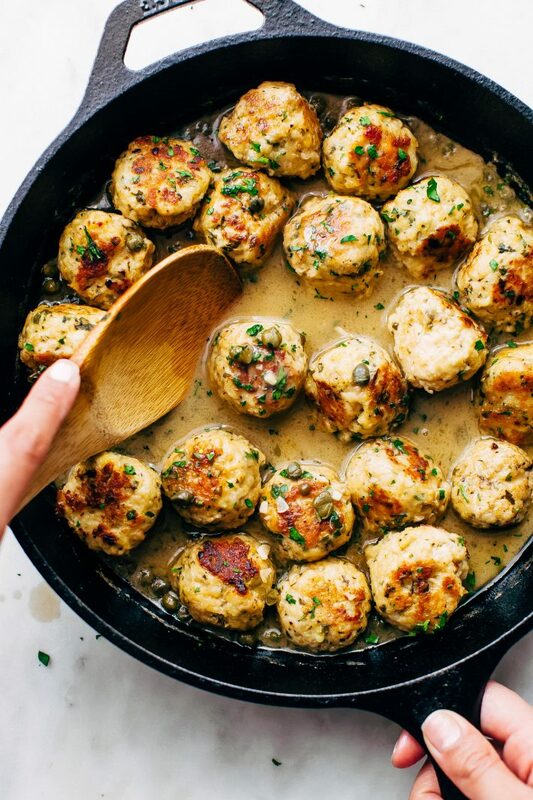 A little sumthin’ for winter (try the Swedish meatballs ) and then some for spring, like these chicken piccata meatballs. 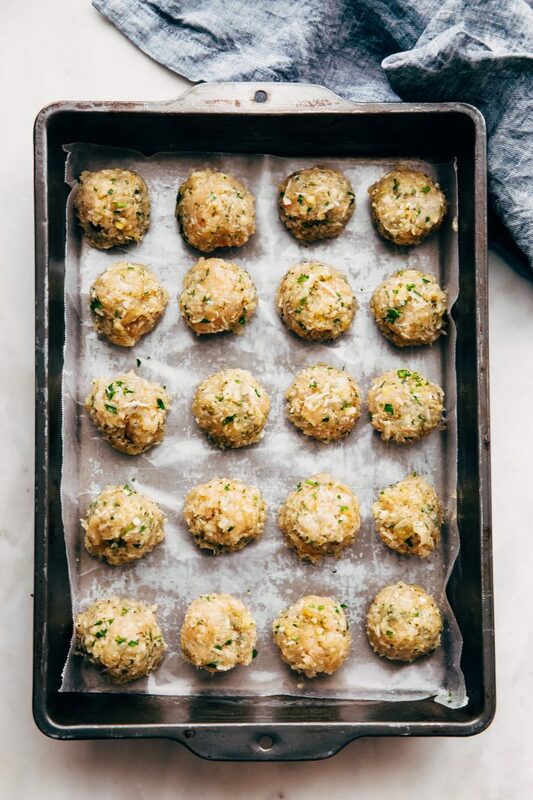 And before you know it, there’s a meatball recipe for every month out of the year. And these are extra special because I can serve them over egg noodles for when I want a real weekend treat or with a side salad for days when I’m watching the carbs. And wasn’t there something called a ‘zoodle’ not too long ago? Are they out? Because that was quick. I mean, just 5 minutes ago errbody was getting a spiralizer and then all of a sudden the internet decided they didn’t make the cut this year. 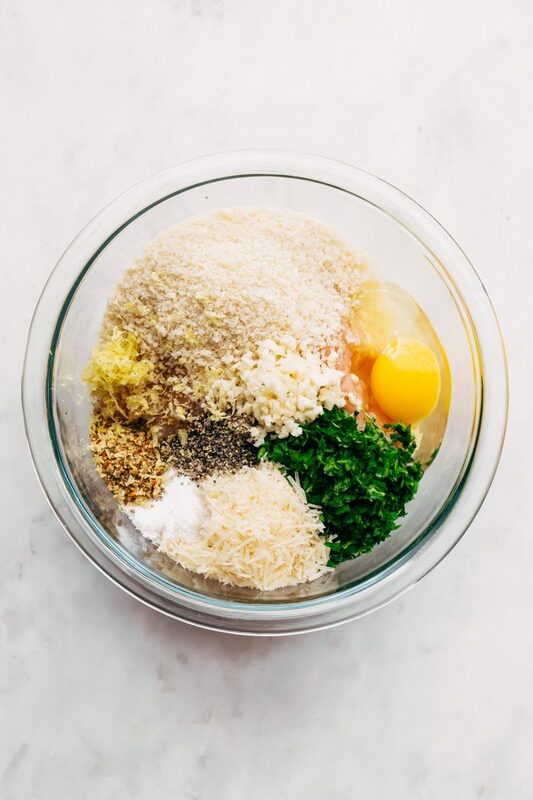 One tip I like to share about making meatballs for any recipe: combine everything but the meat in a bowl first so you can ensure even mixing without overworking the meat. Once you add the meat, mix until it’s just combined. This way, you always end up with a tender, meatball. When you overwork the meat, you almost always end up with dry meatballs. And I’ll be honest, there are times I throw it all in a bowl and call it a day too but I almost always end up regretting it. The texture is so much better when you take an extra minute to do it right. Once you’ve made the meatball mixture, just divide them into 20-22 portions. I use a medium cookie scoop  (affiliate link) so that all the meatballs are the same size. This also cuts out the guesswork because they cook in the same amount of time. We’ll sear them in a hot skillet so they develop color. Then, we’ll let them finish cooking in the piccata sauce. This allows them to soak up all that lemon butter flavor. For the piccata sauce, we’re using chicken broth, flour, lemon juice, capers, minced garlic, and a little butter. Why the flour? We’re using just a tiny bit so we can cut back on the butter a little. Normally, to thicken the amount of chicken broth we’re using, you’d need way more than 3 tablespoons. And those of us that are still hitting the treadmill hard need to save those butter calories for other things like peanut butter stuffed dates! Gah. It’s a gloopy-gloppy addiction. You have to try it. And basically what I’m trying to get at is that chicken piccata meatballs are the new way to eat chicken piccata. Listen, I don’t know about you, but I’ve always hated dredging chicken cutlets in flour. 1.) because who has the time to make cutlets and 2.) because I hate dredging things in flour. 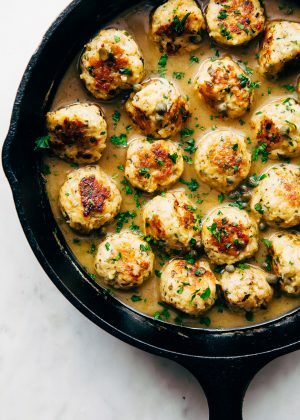 So if you fall into one or both of those categories, as I do, my friend, these chicken piccata meatballs are for you. Seared tender meatballs in golden sunshine sauce. A new twist on the traditional chicken piccata! 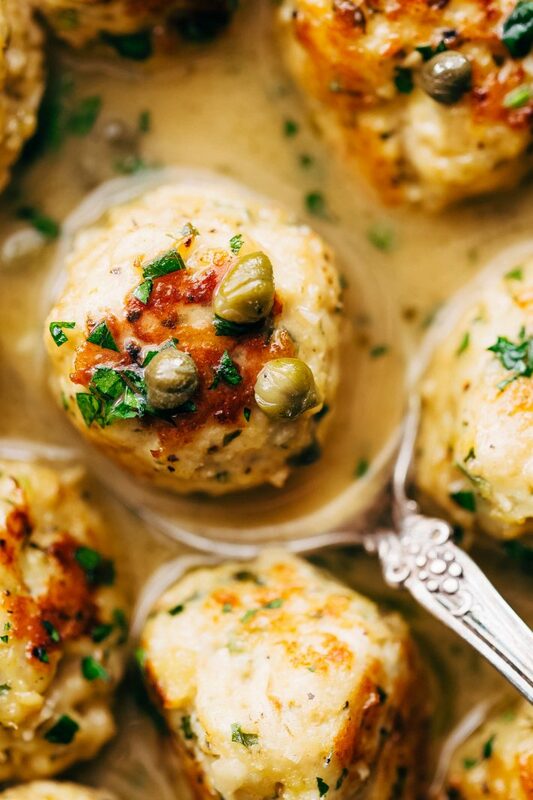 These chicken piccata meatballs are made with ground chicken and nuzzled in a rich lemon butter sauce. Serve it over pasta, quinoa, or with crusty bread on the side. Meatballs: In a medium bowl, using a fork, mix together all the ingredients except the ground chicken. When the ingredients are combined, add the ground chicken and mix until *just* combined. Just be sure you don’t overwork the meat. Roll into 20-22 meatballs using a cookie scoop  (affiliate link) or about 1 1/2 tablespoons each. Heat a large skillet over medium-high heat. Drizzle in a little oil. 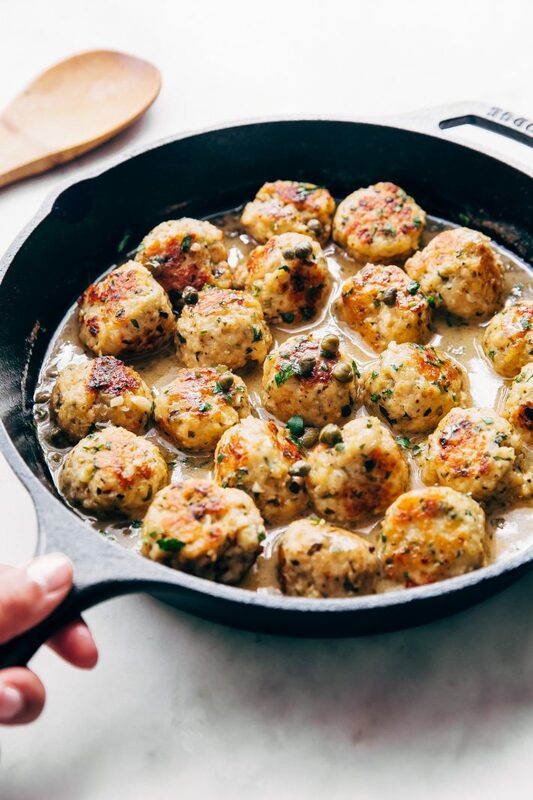 Add the meatballs to the skillet but do not overcrowd. Cook in batches if they don’t all fit. Sear the meatballs for 4-5 minutes, flipping to brown all sides evenly. We’ll finish cooking the meatballs through in the sauce later. Remove meatballs to a plate. Sauce: Add 1 tablespoon of butter to the skillet along with the garlic and cook for 30 seconds or until fragrant. Add the flour and whisk. Once the flour cooks for 30 seconds, slowly drizzle in the chicken broth with one hand while you continue to whisk with the other hand. Add the caper brine, capers, lemon juice, and allow the sauce to gain a simmer. Then add the meatballs reduce the heat to medium and let thicken, about 5-7 minutes. Lower the heat to low, add the remaining 3 tablespoons of butter and allow them to slowly melt into the sauce as you stir. The butter will help thicken the sauce further. Serve with additional chopped parsley on top if desired. The sauce will thicken as it sits so I’d advise keeping a little additional broth on hand if you don’t plan on serving this right away. Serve over egg noodles, zoodles, quinoa, rice, or with crusty bread!